Viborg Kunsthal aims to make art relevant to everyone by reflecting today’s society from a new perspective. Since 1994, when it first opened its doors, the Viborg Kunsthal art gallery has had the vision of exhibiting contemporary art that resonates with our present-day society. “We choose artists who, in some way, do projects on topics that matter, on something everyone can relate to. Our mission is to be the catalyst of living and dynamic art and to communicate it to everyone,” explains Bodil Johanne Monrad, head of exhibitions at Viborg Kunsthal. That is one of the reasons why the gallery is continuously working to find new ways to communicate its exhibitions to the public. One new project, for example, asks pre-school children to talk about art and then transforms their thoughts and observations into a podcast, which is available to all visitors. “It’s a great way of introducing art to people who do not normally visit art institutions. By letting children talk about art, it offers new perspectives and humorous narratives,” says Monrad. 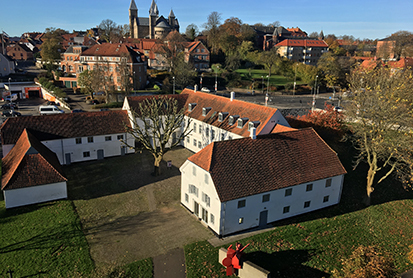 The beautiful and historic building which houses Viborg Kunsthal is often a venue for site-specific art works, made specially for the exhibition rooms. Artists typically stay in Viborg for a period of time before presenting their exhibition. Portugal, while also highlighting the European migrant crisis. “It’s a really powerful piece that does exactly what we want to do. It tells a story about the world we live in, and it forces us to see things from a different perspective, to take a stand and debate whether our approach to this issue is the right one,“ says Monrad, adding that Zamora actually hired migrants to destroy the boat during a performance in Portugal. The exhibition Ordem e Progresso runs from 8 June to 26 August.